We are always making efforts to providing better products and service. Well designed and made, comfortable to wear. 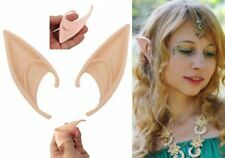 Flesh Elf Pixie Fairy Pointed Spock Ear Tips Fancy Dress Costume Accessory. Kids Reindeer Antlers Ears & Tail accessory set. Soft brown fabric antlers and ears are attached to a flexible headband for comfort. Perfect for Christmas parties, Halloween and animal them fancy dress events. The large brown fabric moose antlers and ears are attached to a flexible headband for a comfortable fit. Lightweight for use all night at the party. Adults Giant Antlers fancy dress accessory. Large brown fabric moose antlers and ears. Donkey Set. fancy dress accessories. DS122 - Lamb Set Sound Child. Consists of ears on a white headband. Nose - makes a squeak noise when pressed. White tail to attach to clothes. Black bow tie. Nativity-Christmas-Bible UNISEX DONKEY/RABBIT EARS ONE SIZE. Costume Fancy Dress Brand New . Perfect for nativity plays. 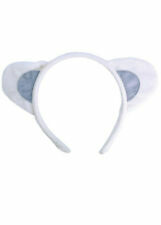 Kids Sheep Ears and Tail set. Foxy Fancy Dress LTD. The tail is on a loop so will attach with a pin. Bear Set (Ear, Nose, Tail, Bow Tie) Sound. Nativity-Christmas-Bible DONKEY HOOD, EARS AND NOSE Accessories One Size. Handmade f estive red wire ears, adorned with festive holly berries and leaves for a tradition Christmas look, finished off with a festive hessian red and white reindeer bow. Design received may differ slightly. Pixie Ears. Includes: Pointy Flesh Ears. SHARE WITH A FRIEND. One Size: Adult. Receive an order within 24 hours! ORDER BY 1PM. Take an elfie selfie this Christmas with these festive clip on elf ears! 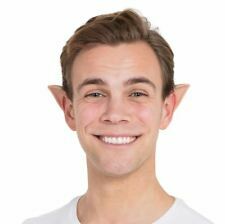 Sure to be a hit with the whole family, these fun elf ears are easy to attach. Austin Powers. Fireman Sam. Paw Patrol. Sonic The Hedgehog. The Flintstones. Wizard of Oz. Scooby Doo. Accessories > Other Accessories. Headband with ears and horns. May not be suitable for children under 3 years of age due to small parts. GREAT FOR FAIRYTALES CHRISTMAS ELF BFG COSPLAY. 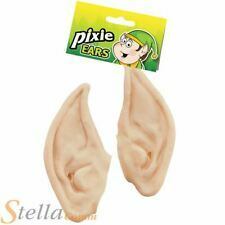 Flesh coloured pixie style ears that simply fit over your ears. 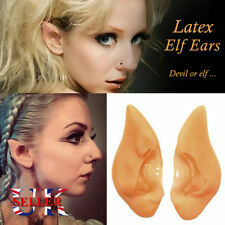 Soft Vinyl Pointed Elf Ears. We are always making efforts to providing better products and service. Made from high quality material, comfortable to wear. 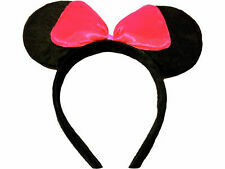 Hand Made Disney Ears Headband Mickey / Minnie, Florida, Paris, Christmas style. Condition is New. Each set of ears I make are unique and the picture is the exact ears you will receive. DSX122 - Lamb Set Sound Child.